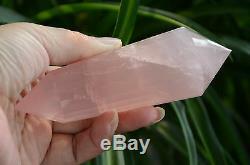 REAL TIBET HIMALAYAN NATURAL ROSE QUARTZ CRYSTAL 24 sided DT VOGEL WAND 4.84 INCH. 123mm(4.84 inch) long, 3929mm (1.53-1.14 inch) wide. These POWERFUL healing tools have been individually hand picked for uniqueness, the power of additionalenergetic properties, maximum energy and are the highest Quality on the market. These beautiful crystals have been blessed and energized by our master cutters in our factory. Keren crystal factory: Our factory has been cutting Vogel since 1998. 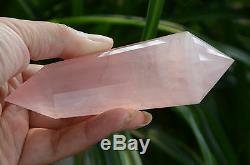 Keren crystal are imbued with the healing light and compassionate energy. For over 19 years, our cutters have been channeling these entities of light, love, compassion, and peace, bringing miraculous healings to millions of visitors. The Crystals are originally sourced from mines in Tibet Himalayan. Each month we receives deliveries of water, and crystals of different kinds. Once at our factory, the water and crystals are programmed by our master cutters specifically to benefit the healing of all people touched by the Tibet Himalayan energy. Our business information is as follows. Tibetan high altitude quartz crystal induces amplification of you own special energy field, it can and will produce a huge force field of healing negative ions and will clear the area of positive ions which can harm you and your loved ones. This Tibetan crystal is a huge amplifier and transformer of energy, your smallest thought will be immediately enlarged by this sacred crystal. 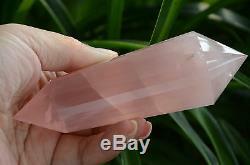 Healing property : Vogel Wands Quartz Crystal is a master healer and can be used for any condition. It stimulates the immune system and brings the body into balance. It is excellent for soothing burns, harmonizing all the chakras and aligns the subtle bodies. It has been used in the treatment of disorders of spinal alignment, circulatory disorders, ameliorate toxicity, strengthen the structure of the veins and disseminate and disperse growths. It is beneficial in balancing polarities, carpal tunnel syndrome, strokes, multi dimensional healing, multi dimensional cellular memory healing, efficient receptor for programming and brings the body into balance. Like a Laser, Vogel's cut out the dis-eased or outworn, opening new energy channels in the subtle and physical bodies. 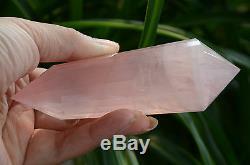 Rose quartz is often called the Love Stone. It's energetic hallmark is that of unconditional love that opens the heart chakra. This makes rose quartz a stone for every type of love: self-love, family, platonic, romantic, and unconditional. As a variety of quartz, rose quartz has high energy, and this strong energy can enhance love in virtually any situation. All of our crystals & stones are natural and have formed over millions of years. Please wait until all the auctions ended. If you are not fully satisfied, pls contact me immediately. We have our own factory , which enables us to offer you best quartz at greatest wholesale prices. We have more than 10 highly skilled master craftmen available to accomadate your special crystal and quartz needs. You name it, we got it. Our customer service motto is customers are always right. We provide you with guarantees of 100% shopping pleasure. Based in Donghai county, China which is global quartz and crystal centre and is also dubbed'the hometown of quartz and crystal', our factory has been dealing with quartz and crystal for over a decade. It is your one-stop shop for all your crystal needs. We carry quartz and crystal from all over the world. Because we have our own factory, we offer you quartz with best quality and price. Our factory has more than 10 highly skilled technicians available to accomadate your special crystal and quartz needs. Slashing middlemen and inflated retailprice, our products with greatest craftmanship are really affordable alternatives to luxury quartz items in the west. We are committed to 5-star service. Here are a few of the wonderful comments we receive from our dear customers who quickly become dear friends whether they live across the state or across the world. I was impressed and thrilled when I received the last two custom quartz wands you made for me! The wands were expertly cut, and crystal clear just like the others that you have made for me. With being an energy healer, a wand is very important tool to help with the energy healing. It's not just a pretty piece to admire, but it has an important job to do. It is said, that the energy of the craftsman contributes to the quality of the piece, not just the materials. The energy from the wands that you made from me are amazing! I look forward to continuing our relationship sharing these great products you create to other healing professionals. The item "Tibet Himalayan Pink Rose 24 Side Crystal Quartz Vogel Wand Spiritual 4.84'" is in sale since Thursday, January 24, 2019. This item is in the category "Collectibles\Rocks, Fossils & Minerals\Crystals & Mineral Specimens\Crystals". 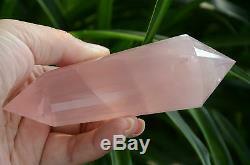 The seller is "crystalcraft1998" and is located in Donghai,Jiangsu province. This item can be shipped worldwide.